Close-up of the vent, which is about 35 m across. One of the primary components in volcanic gas is water. Right at the vent, the plume is transparent, because it is very hot and the water is in vapor form. A short distance above the vent, however, the plume cools and the water vapor condenses into tiny droplets. This makes the plume an opaque white, just like regular clouds in the sky. Where can I go to see the lava flow up close? The current lava flow has reached the ocean, and is crossing land and entering the water at an area near Kalapana that is relatively accessible. A safe viewing program for the public has been developed by County, State and Federal agencies, and coordinated by Hawai‘i County Civil Defense. The viewing area is open daily from 2:00 in the afternoon until 10:00 at night, as long as conditions remain safe for the public. The last vehicles are allowed in at 8:00 to allow people adequate time to view the lava before the site closes at 10:00 p.m. A Lava Hotline is updated daily and confirms whether the lava viewing site will be open that day. The telephone number for the Hotline is (808) 961-8093. Visitors should be aware that conditions can change rapidly, and that viewing will be closed should any changes occur that will threaten the safety of viewers. The viewing site is located at the end of Highway 130. From the parking area, there is a walk of approximately one quarter to one mile across lava to the site. For safety, you are asked to dress appropriately with long pants, closed-toe shoes, hat and sun screen. It can be very hot and sunny, so please bring water, and flashlights if you will be at the site after dark. You should also be prepared for the possibility of rain. There are a limited number of portable toilets available near the parking area, so be prepared. People are asked to stay on the trails as marked and obey any requests by the interpreters that may be issued for their safety. After a long pause from June 17th 2007 Lava has finally made it back to the coast providing some spectacular viewing. Unfortunately for viewers it is outside the National park in County controlled territory meaning first that legal viewing begins only at 2:00pm with last car in by 8:00pm and everyone out by 10:00pm. Do NOT go at or near 2:00pm as it is chaotic and unpleasant...Government in action. Even with grossly excessive regulation it is still an amazing sight....come on down and take our tour, take a plane flight or rent a car but see it....soon !! 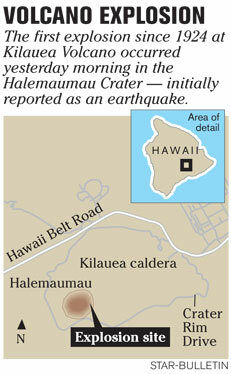 For current updates go to http://volcano.wr.usgs.gov/hvostatus.php The town of Pahoa is no longer threatened. Daily viewing: From 2 to 10 p.m. Last car in at 8 p.m.
Activity Summary for last 24 hours: A long and narrow pahoehoe flow continued to advance from the base of the Royal Gardens subdivision toward the ocean. The flow split and at 3:30 pm, the western lobe was 230 m (750 ft) from the ocean. Seismic tremor levels and sulfur dioxide emission rates continued elevated to several times background levels at Kilauea summit. Hazard Summary: Four hazardous conditions exist currently on Kilauea volcano - potentially harmful sulfur dioxide concentrations at the summit, dangerous conditions around the Pu`u `O`o/July 21/November 21 vent area, lava flow threat to the Royal Gardens subdivision and the coastal plain to the southeast, and hazardous conditions associated with lava entering the ocean. 1. 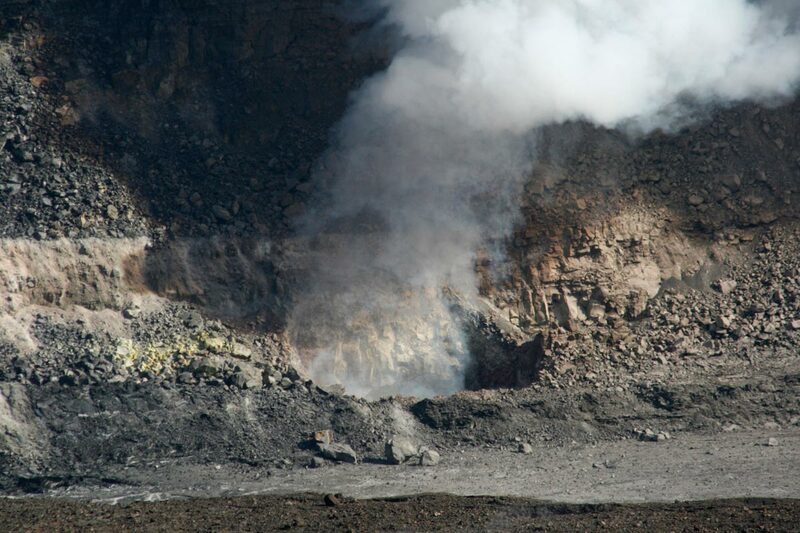 The current increase in sulfur dioxide emission rates at the summit means that SO2 concentrations in the air are likely to be at hazardous levels for visitor areas downwind of emission sources in Halema`uma`u crater. Because of this the National Park Service has closed Crater Rim Drive through the south caldera area until further notice (http://www.nps.gov/havo/closed_areas.htm). Most people are sensitive to sulfur dioxide at these levels . Children and individuals with asthma, chronic obstructive pulmonary disease (COPD), or other breathing problems especially should avoid downwind areas. 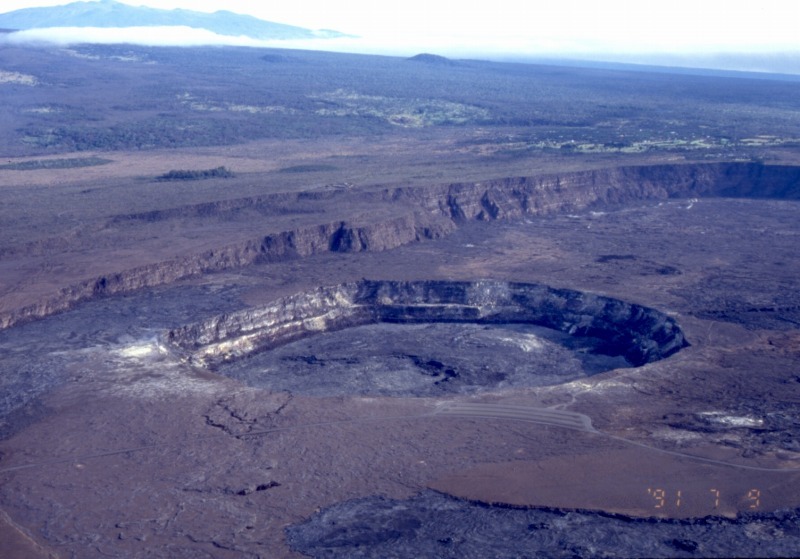 During tradewind conditions (brisk winds from the northeast,) concentrations will be highest and most hazardous in the south caldera: southwest rift zone, south caldera pullouts, and the Halema`uma`u overlook parking lot. During weak or southerly winds, concentrations may be high and hazardous throughout the summit area. 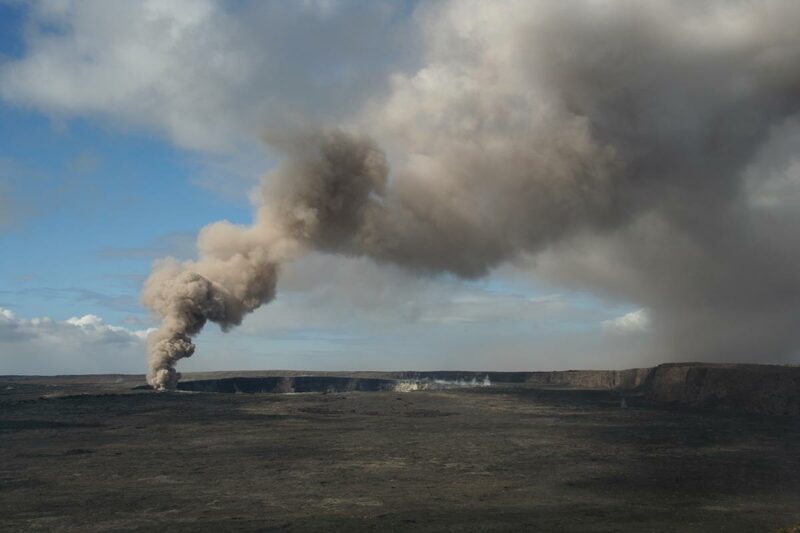 Stay informed about SO2 concentrations in continuously monitored areas at Jaggar Museum and Kilauea Visitor Center (http:// www.nature.nps.gov/air/webcams/parks/havoso2alert/havoalert.cfm). 2. 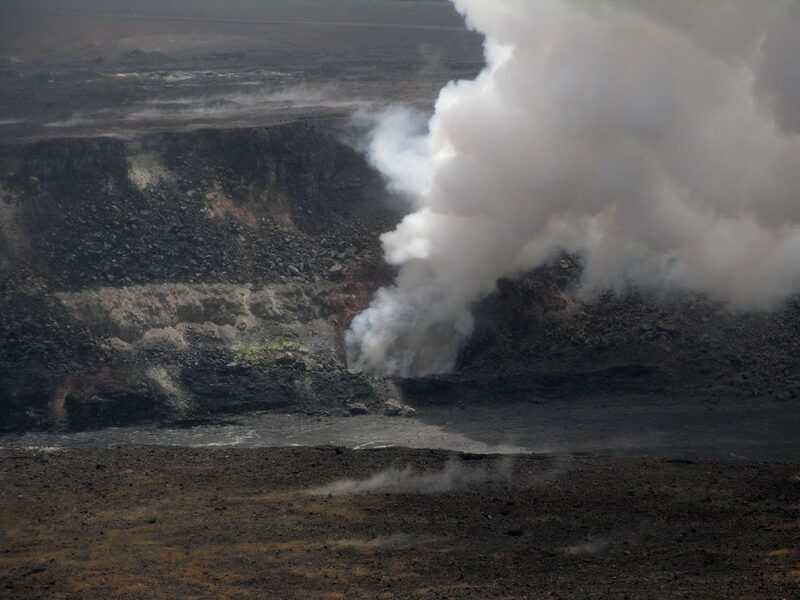 Vent areas and lava channels are hazardous and conditions can change rapidly. Sulfur dioxide emissions from Pu`u `O`o are very high and result in hazardous concentrations downwind. Access to the 7/21 eruption site in the Kahauale`a Natural Area Reserve is closed (see http://www.state.hi.us/dlnr/chair/pio/HtmlNR/07-N076.htm). Wao Kele o Puna is also closed. 3. There continues to be a threat from lava flows to anyone within Royal Gardens subdivision and the coastal plain. As long as lava flows are active south of fissure D, the subdivision is within likely flow paths of future flows. The rootless shields, which are now less than two miles from the subdivision, can collapse and release lava flows that advance that distance within a few days. 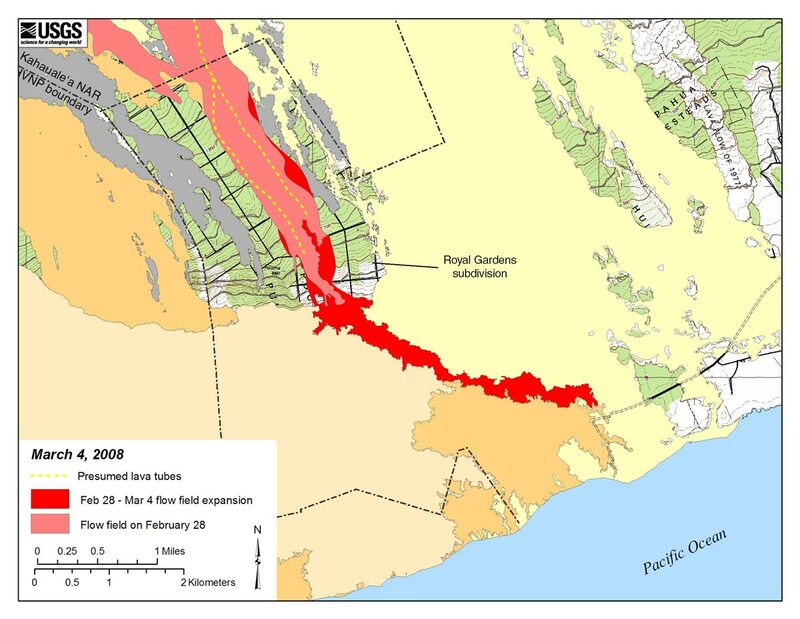 Tube- or channel-fed lava flows established within the subdivision and on the coastal plain remain a threat due to tube ruptures which can produce new lava flows. Lava flows advancing through vegetation are hazardous and can produce fire and methane explosions that propel chunks of lava and rock several feet into the air. Hawai`i County Civil Defense has been notified and is taking appropriate measures (www.lavainfo.us). 4. Lava entering the ocean poses two additional hazards - potential collapse and laze. Lava entering the ocean builds a delta over its own rubble that is extremely unstable. That delta can collapse without warning and expose very hot surfaces to waves which can explode and throw rock debris up to one-quarter mile inland. For these reason, spectators should avoid the delta and the area one-quarter mile inland. The interaction between seawater and lava produces a steam plume laced with acids and fine particles of volcanic glass or 'laze' that is unhealthy if inhaled and can produce skin or eye irritation if contacted. Hawai`i County continues to prepare for safe public viewing hopefully this weekend. For details, see www.lavainfo.us.